.925 Silver, 18 k Gold. 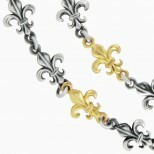 This fleur de lis chain has every 4th link in gold, and the rest are in silver. Total length of chain is 27 inches. Each fleur de lis link is 18 mm long and 10.5 mm wide. 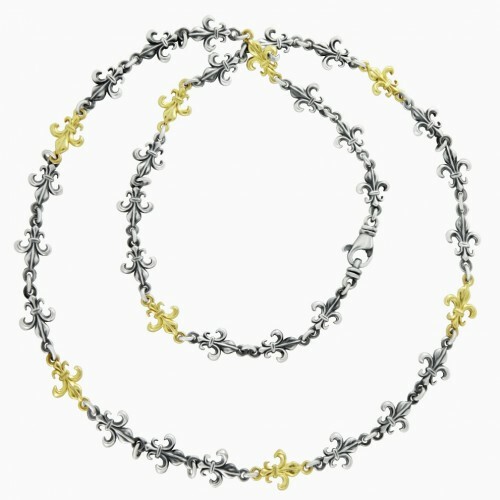 Great layering piece or chain for a pendant. For a special order for a different length, please contact us. The price will vary on length, this listing is for a 27 inch chain, we can make any length starting from 16 inches.